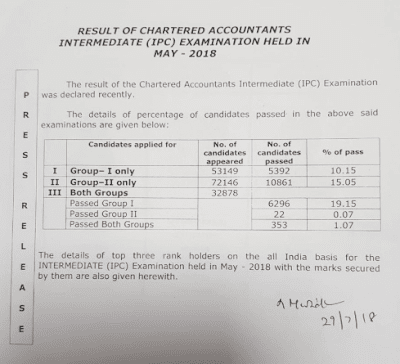 IPCC CA Results 2018: On 29-07-2018, The Institute of Chartered Accountants of India has announced IPCC CA Results 2018 for MAY Exam on its official website that is icaiexam.icai.org. 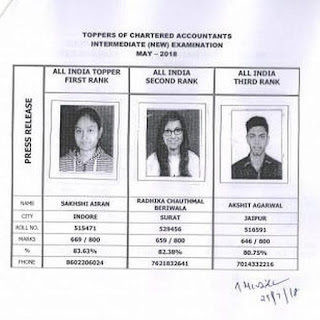 To check the Group I/II ICAI IPCC Marks candidates have to follow the below mentioned procedure. Aspirants can also hit the direct links provided below in order to download IPCC CA Results 2018. All the candidates who have appeared for the examination can check the results through the official websites. Along with the CA result, the all India merit list will be made available soon on this page. We the team of www.privatejobshub.in is providing complete details of IPCC CA Results 2018-19 on below section of this page. So have a look and grab the details. 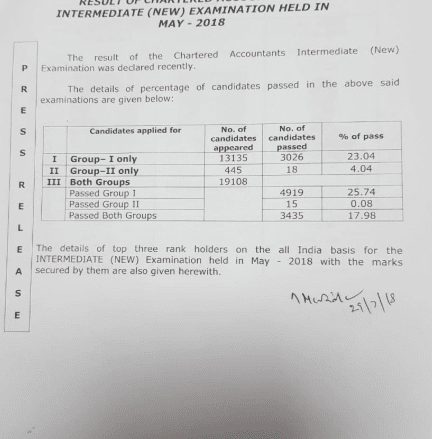 To get CA IPCC May 2018 result through SMS, candidates first have to create a new message in their phones and then enter CA INTER (Space) XXXXXX (where XXXXXX is the six digit Intermediate (IPC) roll number). After that send message to 58888 and download your IPCC CA May Exam Results 2018. For any further clarifications contact Help Line Telephone numbers: 0120 3054 851, 852, 853, 854 and 835 0120 4953 751,752, 753 and 754. 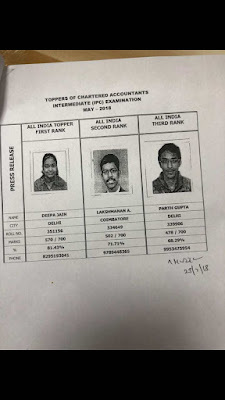 Pass Certificate: Applicants who will qualify both the groups of an examination will be issued Pass certificate by The Institute of Chartered Accountants of India. It will be provided within 60 days from the date of declaration of result. Pass with Distinction: If any candidate passed in one sitting with 70% of the total marks will be considered as Pass with Distinction. Candidates can go through this Official Link to grab rest details of IPCC CA Results 2018-19. Applicants can subscribe to our free mail services to get instant mails directly in their mail box.